The State Horticulture Nursery initiated series of developmental activities mainly focused on maintenance of accredited nurseries. The Year wise calendars of farm operations were actively executed as per the requirement of the crop under different progeny mother blocks. 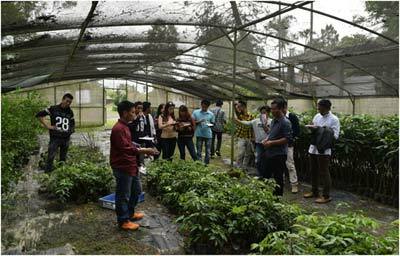 Besides farm developments and operations, the SHN have conducted several trainings and Farm visits for students and visitors from within and outside the state. Recently, under MIDH (CSS), the first ever Hi-Tech Nursery in the state also known as Semi-Automated Vegetable Seedling Production Unit was successfully installed and inaugurated by Shri. Jalaj Shrivastava (IAS), Additional Secretary, DAC & FW, Ministry of Agriculture & Farmers’ Welfare Govt. of India. The Hi-Tech production unit has the capacity to produce 70,000 quality seedlings per unit batch which will serve as a boon to the farming community of the district.